AND take All the Fuss and Time out of Managing YOUR Daycare Business with this EXPLOSIVE Administrative Software! If you would like to keep accurate and up to date records on all of your clients, manage the expenses and financial details of your business with ease and efficiency and run a daycare center that is a step above the rest, then this might be the most important letter you'll ever read. This package not only manages your client billing and your every day finances, but it also manages to build a highly detailed and easy to use database of crucial client profiles! All of this detail and all at your fingertips! You will never be better organized! Daycare Manager Pro is one of the most highly respected organizational software packages on the internet because it offers you more features and functions than other daycare management software does, and it does it better! But it seems everywhere I've looked, all I've found is company after company trying to pass off the same old, run-of-the-mill daycare management system as a "revolutionary" new service. Their systems can establish databases, they can create classes, they can store medical records, and some of the more sophisticated ones can handle things like making forms and reports. ... But give me a break! Are these the features that have the potential to allow you to manage your daycare business like clockwork? Save time and energy by having all the essential details about your clients at your fingertips in our highly detailed database – and it’s so easy to use! You don’t have to be a computer expert! Build your database from 20 clients to 200, and spend barely any extra time finding files, attendance records and billing notes! Never leave it to chance again. All of the crucial information is safely stored and is accessible… at the touch of a button! Deliver a highly personalized and professional service to your clients. Take advantage of the highly detailed profiles that you can build for each child. Have all the personal details you need at your fingertips and sustain that competitive edge over your competition! Manage your business billing and reporting with ease. You can know the status of an account or be able to generate a report in a matter of minutes! Keep up with your billing and invoicing using the billing features and invoice your clients accurately and promptly! Manage your cash flows efficiently! Banish the stress of learning by taking advantage of the comprehensive and easy to follow help menu, and learn the skills in the minimum of time! Manage an unlimited number of clients. No matter what the size of your business, this package will work wonders for you! Protect the health of all your clients by maintaining crucial doctor’s records and immunization records. Use this vital feature to eliminate the risk of mistakes and misunderstandings when it comes to the safety of the children in your care. Create stationary for class use to help with the collection of attendance and drop off and releasee data - which can all be stored and managed easily using Daycare Manager Pro of course! ... and you want it to be EASY! So all this research got me thinking... If I'm this frustrated, after spending months and months looking for a comprehensive daycare management software package and have had to spend thousands of dollars making my own software package, how frustrated are YOU?! The average daycare center owner doesn't have the time (or the cash) to deal with problems like these. And you don't want the SAME daycare management solution that every other business owner and their dog is having trouble with! "Advanced management capabilities" that only a select handful of professional daycare center owners are using (and 99% will never show you) that can help almost GUARANTEE the success the management of your center! An "all-in-one" solution that lets you link the critical components of your e-mail marketing into one complete, hassle-free software that you do NOT need a Ph.D. in Computer Science to use! So I decided that, since I couldn't find this software anywhere else, I'd build it myself... ... AND to offer to all my customers and subscribers who've been telling me that they've been experiencing these exact same frustrations. Of course, we built it to include all of the basic features that ANY daycare management software solution should have, but I'll tell you about these later. How do you keep track of your class attendance sheets, personal notation for children, billing records,crucial client profiles, child reports and cash flow reports? Let me guess: a whole string of different folders within folders, a few piles of paper stacked strategically on your desk, and the odd post-it note on your monitor... am I right? Run and manage all the vital functions of your daycare center from ONE central location! Use professionally designed templates and forms to produce professionally customized reports and invoices! Manage your client profiles, your class attendance records, your invoicing and the accounting of your daycare expenses all at once with this dynamic one-stop program! Personalize and customize each of your clients' records and billing procedures so that you can deliver tailor made solutions to meet the individual needs of each client! Save valuable time and effort by being able to add class notes and progress reports to a client's file for safe and accurate administrative feedback. ...This is your truly ULTIMATE daycare management tool, from where you can manage the individual needs of each and every client from one simple easy location! You can instantly access a client's file and account details in a matter of seconds. You can identify exactly what is owing on a client's account, and identify when the client was invoiced, and when the payment was received. This really helps for the accurate and up-to-date book-keeping that is crucial to running a small business.
" I've used Day Care Manager Pro for the last 4 months now, and now that I am totally used to it and familiar with all of the functions, I would recommend this to anyone serious about their business. I was pretty organized as far as the client billing and personalized service I offered to my customers, but it took me so long to do it! Dynamic Settings Function Enables You to Accommodate a Variety of Different Clients and Family Types. The flexibility and simplicity of the settings menu enables you to quickly and easily tailor a profile and range of settings that is sympathetic to the diverse nature of the modern family unit. I know that there are a lot of different family situations out there, and I insisted that Daycare Manager Pro recognize this diversity by enabling you to create your own titles, contact details and account types to best fit the needs and requirements of the children and families in your care. The settings option enables you the opportunity to create your own titles, contact details, and account types to make sure that you can accommodate the needs of your customers in a personalized and efficient manner. I truly believe the personal touch is what can differentiate one good daycare center from another. Daycare Manager Pro will support you in doing this, and delivering a better service to your customers. "When my wife and I decided to start up a Daycare Center we had no idea how much work it was going to involve. The first year in business we spent a lot of time and effort in building the business, to the point where we have 4 classes of 15 a day. We are making good money, but it also means I have to spend a lot of time sorting out the administration and day to day management of the center. Managing a daycare center involves accommodating the needs of a variety of different people. Preschoolers, infants, after school programs, each of which involve the provision and charging of different services, often at different rates. Whether you do billing weekly, monthly, or calculate it according to an hourly rate, Daycare Manager Pro is capable enough to accommodate the needs of your daycare center. You can select from a range of different billing options and choose one that fits you best. Daycare Manager Pro is flexible enough to recognize these different requirements, and allows you to select or create a range of different pricing options. A charges and payments menu also allows you to itemize additional charges and overheads and add them onto a customer's account. This enables you to customize a child's billing to reflect the expenditure and activities allotted to that child. Everybody knows that the key to a successful business is credibility and cash flow. The administration of customer accounts is often a laborious and repetitive task, and Daycare Manager Pro will help you make this process a lot easier and more efficient. Every feature we have packed into this package is designed to make it easier for you to manage your day care center. If you have a field trip or a day out, add it onto your customer's account and itemize it. It's that easy! Anneliese is Blitzing Her Competition in Her Area Thanks To Her Increased Organization and Personalized Service! "When Anneliese took over an existing daycare center in her area, she was forced to compete with two other daycare centers in her area. Since all of them offered a very similar service, it was the standard of service that she offered to her customers that differentiated Anneliese from her competitors. "When I bought a day care center in my area, I was not aware of the level of competition in childcare in the area. At first it was really hard, with me being one of 3 daycare centers in the neighborhood. I decided that I was going to offer a level of service that would make me stand out above the rest. When I was searching around on the Internet I noticed your program and thought it would be just what I needed to streamline my business and help me achieve my goal. It has exceeded my expectations, and after 4 short months I am the leading daycare center in my area. I love how detailed the child profile is, as it really helps me remember details about the children in my care. The doctor's records feature is great too. I take my business seriously, and thanks to Daycare Manager Pro, the time I spend updating files and managing children is greatly reduced. This gives me more time to focus on the children. The parents really like that..."
Accounts area allows you to add charges and payments as well as the crediting of subsidies on a child's account. With a child profile like this, all the information you are likely to need is literally at your fingertips! Quality of service is paramount in delivering competitive advantage, and Daycare Manager Pro is aware of this and supports this theory as a crucial marketing tool. "Since installing your daycare software I have reorganized my business so much. I had a filing cabinet full of files that were never put back in order. Whenever I really needed a file it took me ages to find. Billing and invoicing was something that I used to pay a secretary to do all the invoicing. After getting Daycare Manager I can do it myself, its so easy. Now all the most important stuff that I need for running my business is stored in your program. I got rid of most of the files in my cabinet, and they are all in my laptop. That way I can can take it away with me and do some of it from home. My wife is pretty happy with that arrangement too. " Managing a day care center effectively also involves maintaining a current and accurate record of your employees. Qualifications and certifications can be easily recorded, as well as contact details, classes they teach and the salary or wage that they get paid. All of this information is at your fingertips and is a useful addition to your management function. Daycare Manager Pro also maintains an immunization record which keeps a record of what immunizations your staff have had and how current those immunizations are. This is vital to maintain the safety of your employees as well as maintaining health standards and minimizing the risk of spreads of viruses and illnesses in your day care center. Daycare Manager Pro also has an emergency contacts menu and a notes section so that you are able to keep accurate and important notes on your employees close at hand. You will be able to say goodbye to endless searching for files and folders, all costing you crucial time and frustration! The administration of employee records is often a laborious and repetitive task, and Daycare Manager Pro will help you make this process a lot easier and more efficient. The information in the employee records database is information that you may need to access quickly. Every feature we have packed into this package is designed to make it easier for you to manage your day care center and manage your employees. David's Business Is Booming With Day Care Manager Pro! Automatic Billing and Crediting Functions Take ALL the Work Out of Managing Your Daycare Accounts! One of the most important aspects of running a successful small business is managing your cash flows effectively. Your cash inflows from customers enable you to pay your expenses and bills, and managing this effectively enables you to run your business with a lower working capital. Automatic billing feature which enables you to automatically add attendance fees and charges to a child's account. You can choose the dates that the amounts are billed to the account and it will add it automatically! Automatic subsidy crediting feature allows you to automatically add the subsidy credits to a child's account on a specified date. Given the repetitive nature of crediting subsidies, the automation feature is a valuable addition to Day Care Manager Pro to help simplify your billing process and reduce the occurrence of errors in billing amounts. Don't leave your client billing to chance. Use our Automatic billing and Crediting functions and know that nothing is being missed at billing time! These are your cash flows we are talking about! Make billing time easy for you and avoid the risk of making mistakes and forgetting to bill clients! "Having found and tested your software package, I found it to fit the needs of my daycare center really well. All the other programs I had looked at had features that I didn't really want, and not much of what I really needed! Daycare Manager Pro had revolutionized the way I run my business, and it's a real bonus that it is so easy to use. I don't have the patience or the time to spend weeks trying to learn a new system. But Daycare Manager Pro is really easy to use, has a good help menu if I do get stuck, and has all the features that I really want in a management package. Reporting Function That Leaves Other Management Programs In It's Wake! One of the most useful functions that sets this package apart from the rest is the effortless availability of reports that are crucial for the functioning of a day care center, and all at the push of a button! Waiting lists of children who have registered interest in attending your day care center. This can enable you to target advertising at them to maintain their interest, as well as develop a strategic plan for your business into the short-term future regarding composition of classes and class sizes. Doctors report that gives you crucial medical information as well as insurance and health provider details. In an emergency situation it is critical that this information is available promptly. An attendance report by child that lists all the recorded times that a selected child is in day care, including time signed in and time signed out, daily total and weekly total. A late payments report that shows all money owed outstanding to the day care center, the name of the account holders, and the balance outstanding, as well as a combined total. All of these reports are easily created and anyone can do it! I have purposely made it easy to use so that you can generate professional reports involving vital functions of your business in a matter of seconds. It has never been so easy to get the information you need! Vicki Thought She Was Going To Need To Be A Computer Expert To Understand How To Use Her New Software Package - How Wrong She Was! Organize And Streamline Your Business With Customized Stationery! Keeping your records will be much easier with customized rosters and forms, and will save you hours of time and effort sorting attendance details and times the children are in your care. It is features like this as well as the may others in this revolutionary day care management solution that is going to deliver real results for you and your business! Let's face it... nobody likes having to spend endless hours sorting through records and files for information and billing details, as well as child profiles. You want the information to be as easy as possible to access, and have it presented in a format that is both useful and professional. It is all about managing your day care center in the best way possible, and I truly believe that I have created a package that is really going to do this. No matter how big you are... No matter if you are just starting out... You are going to change the way you run your business and get results that are way beyond what you thought possible! I have created a package that is going to eliminate the stress and the endless hours spent sorting through records and files. 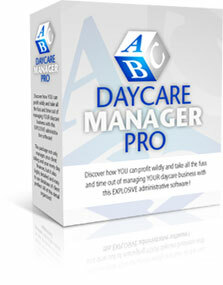 Once you have tried Day Care Manager Pro you are going to wonder how you ever coped without it! Did you know that similar packages like this are retailing for around the $500 mark? That's what my competitors think you should be paying for life-changing technology such as this. For a small business like yours, that's a significant gamble to take, relying on the fact that their packages will suit your day care center, and you need to learn how to use them! And how easy is that? And they don't even have all the features that are in Day Care Manager Pro! I believe Day Care Manager Pro is a hundred times better than the packages my competitors are offering, and I'm not going to rip you off to the tune of several hundred dollars! I am offering you this package, at no risk to you, and all for a fraction of what I could be selling it for if I was greedy like my competitors! I want all day care centers of all sizes to be using my software, so I am offering it at a fair price so you can all benefit from my hard work. I want to make sure you have everything you need to immediately guarantee the success of your daycare center. You can discover effective ways to combat bullies and bullying problems in your home and work environment! We are offering you this amazing book with full reprint rights so that you and your daycare clients can use this excellent resource. We are offering you the right to download and distribute this fantastic learning tool strictly to you and your clients so that you are able to increase awareness and facilitate an anti bullying policy in your center. You are not allowed to re-sell this book, however you can give away printed copies to others for free. Chances are you've probably heard those words before. . ."Plan Your Work and Work Your Plan." Sounds like a pretty good proposition. . . if you are a high powered financier. But, what does that have to do with running a daycare center? Truth be told, it has everything to do with the success or failure of your center. Without a well charted course, odds are that your business has already arrived at a destination. Does that mean that hope for success is lost? Not at all. . .read on! The Business Plan Workbook consists of 65 jam-packed pages that literally take you by the hand and lead you step by step through the process of creating a realistic roadmap of your business. The workbook can be printed out to assist you in thinking through your ideas and will teach you how to organize your communication into the business plan components. Of course, you don't have to decide now. Instead, grab our risk-free offer, use Day Care Manager Pro for 8 weeks, and watch firsthand to see if your day care center is revolutionized! Protection #1: If you're not absolutely thrilled, e-mail me within 8 weeks (56 days) for a complete 100% refund. No hassles. You will be issued a prompt refund, right up to the final day of this guarantee. Protection #2: Even if you cancel, your efforts won't be for nothing. You'll get to keep the TWO Super Bonuses as my way of saying "Thanks." That's a guaranteed gain, no matter what you decide! ... I literally take ALL of the risk for you because that's how much I believe in this package. Picture this: It's a year from today (or a lot sooner), and you've revolutionized the way you run your business and are now so organized you have time to focus on other goals. You might have developed another aspect of your business or even expanded... or you may be spending more quality time with family or at the golf course. Daycare Manager Pro has enabled you to realize your dreams and goals. Now, stop and look back on today. Considering that you've now realized your goals, what price tag would've made it a good investment? With that in mind, I've decided to make Daycare Manager Pro available for customers ordering TODAY for an affordable $49.95. Start Using Daycare Manager Pro in the next 5 minutes! If you request it on the order form, our system will allow you to access the Daycare Manager Pro members area immediately, so you can start transforming your daycare business within five minutes! Even if you have never downloaded something from the internet before it comes with instructions it's so easy! • No risk of products lost in the mail or damaged. • You receive Daycare Manager Pro at a lower price because it costs us less to produce. The fastest way to order is directly online with ClickBank's SECURE SERVER. Clickbank is one of the internet's leading online retailers specializing in digitally delivered products. Keep in mind that when you use ClickBank's order form, we do not have any access to your credit card information at any stage. You can be certain that your details are completely secure. Keep in mind that when you use my order form on ClickBank's Secure Server, you can access Daycare Manager Pro instantly so you can start organizing your business and spend less time in the office from today! Members Download Access provided by DayCareManagerPro.com. If you'd like to have Daycare Manager Pro Shipped to you, it is $99.95 + $14.95 P&P. Goods and services provided by DayCareManagerPro.com. Common Question: What is the difference between the $49.95 version and the $99.95 version? Answer: There is no difference. However if you order the $49.95 version, you'll receive instant access to a members download area where you can download Daycare Manager Pro's software and super bonuses. If you order the $99.95 version, you'll receive Daycare Manager Pro via postal mail (hence the increased costs of distribution). I look forward to getting a letter from you, telling me about your experience with Daycare Manager Pro and about your business success. Even though I get an enormous amount of mail, please write to me. I'd love to hear your success story! P.S. To claim your TWO Super Bonuses and Special Pricing, be sure to claim your copy of Daycare Manager Pro TODAY. Remember, this bonus is yours to keep no matter what you decide! After that date, you may pay a lot more for this software. P.P.S. Don't forget that your software is tax deductible as a business expense. Depending on your tax bracket, its actual cost could be up to 40% less, once your bookkeeper deducts it on your tax return... so be sure to remind him or her, because they might be too busy counting all the cash that comes pouring in once you're using it. Daycare Manager Pro requires a PC Emulator to run on a MAC.